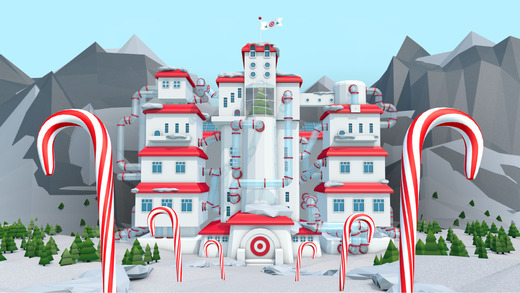 This post is made possible by Target. All thoughts and opinions expressed below are my own. Every year I have a little piece of paper that stays in my purse. On it is a scribbled list of items that my children want for Christmas. I don't typically buy everything on the list, but I pick and choose the items the want the most or that I think have the most value. 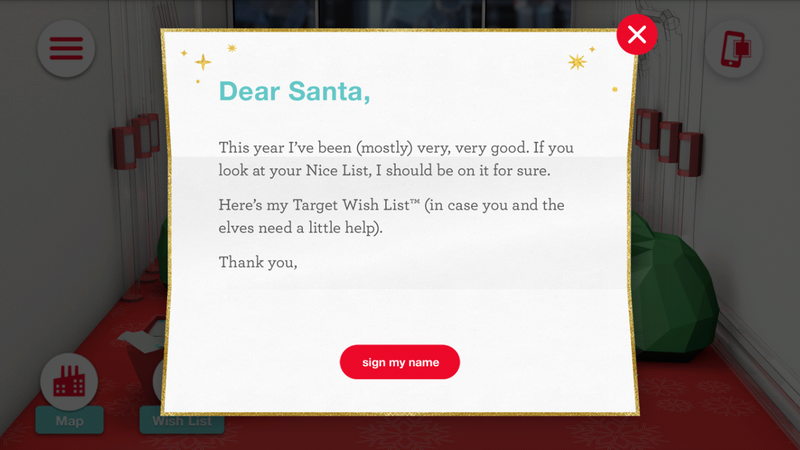 This year, though, things got a little easier for me with the Target Wish List app. This new app is free to download and allows you to create wish lists for up to 10 people. You can even share their lists with family and friends. It is a lot like a Target wedding or baby registry. 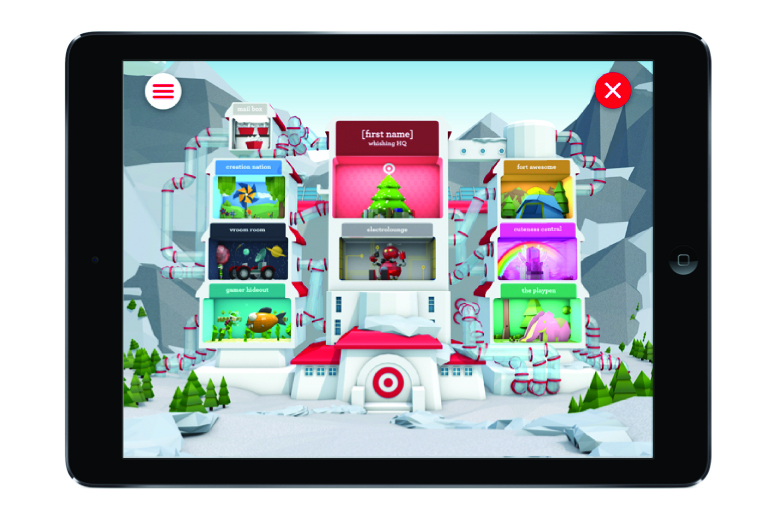 Once you've downloaded the app and signed into (or created) your Target.com account you can begin creating profiles for your kids. 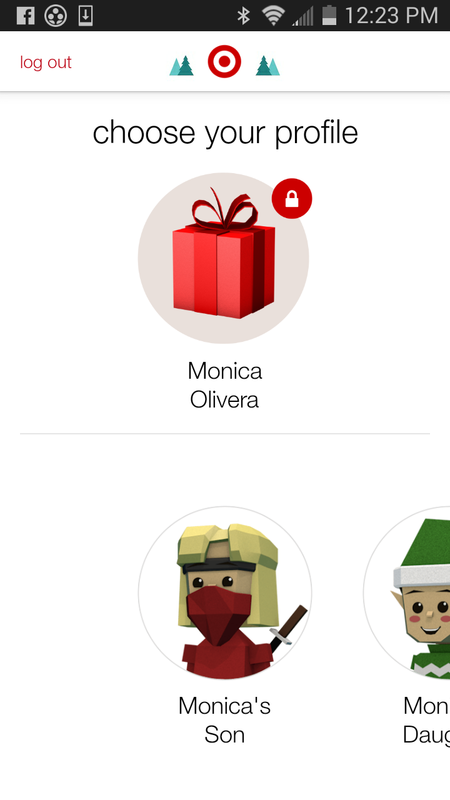 My kids had fun choosing their own avatar and then exploring "Santa's Workshop." Each room is a different area and items from that section pass by on conveyor belts. You can click on items to select them and add them to your wish list. Once your child has finished his or her list, s/he can even send it to Santa with the Letter to Santa option! It requires your child to sign their name using their finger and then boosh! Off it goes to the North Pole. If your family doesn't do Santa, or the kids are too old, then you can just save it and share it with friends. - Limit your children's list. It would be easy for kids to go through and just click on an outrageous number of items making it hard for parents to pick from. I suggest you give your kids a limit and tell them they are allowed to pick 10 - 20 items for their wish list with the understanding that you may choose only a few of those items for Christmas. I impressed upon my kids that they had better select only their favorite items because otherwise I may choose one they don't like as much because I assumed that they really wanted all of the items listed. - Don't use their real names. This is especially important if you'll be sharing their list with friends or family. You'll be entering a shipping address, which may or may not be your home address. Maybe it is the overprotective mom in me, but I know there is no guarantee that the list won't end up in a stranger's hands. So I use nicknames or other ID's such as "Monica's Daughter" or "Brad's Son" to identify my kids. If you aren't sharing the lists, but just using them for yourself, use nicknames to identify your kids. - Share it only via text or email with only close friends or family (ahem...los abuelos!). You'll have the option to share it via twitter (I don't know why you would do that), or Facebook, too. Just be thoughtful in your decision.